Discussion in 'E46 (1999-2006)' started by michaeleconway, Mar 3, 2008. Any thoughts on a Dinan Free Flow Exhaust? Just put one on my 01 325ci - I have read some negative comments - I have stage 2 software, highflow throttle body, highflow intake - it's nice stuff - just wondered if I was missing something! I think what matters is what YOU think of your system - not negative comments you've read. I have a 330Ci with Dinan Exhaust and stage 1 software with K&N stock replacement air filter. Throttle response is definitely perkier. It's actually more responsive than I expected, so I'm pleased. Whether there's more measurable power or faster acceleration doesn't matter to me. It just feels better. The exhaust has attractive pipes, a cosmetic benefit. It does provide a lower frequency, sporty hum at idle and cruising along, but inside the car, frankly, you don't hear much, which is probably a good thing. Intake and exhaust performance benefits are likely only at high RPMs where the air is really pumping through, so these are not enhancements you're likely to feel, or hear, until you stomp on it. I have Dinan S1 package on my 330ci and love it. While the advertised measurable difference is small, 14 HP, it is probably conservative per Dinan's philosophy. I felt the throttle response and power increase the moment I stepped on the go pedal. The front end feels tighter with the strut brace on those off camber sharp turns at the track. I know a lot of it is subjective, but that's really what matters anyway. It's YOUR car, bro. Actually, I chose to do the good-old American designed exhaust system the "Flow Master"
with K&N and since these few mods, she has greatly increased in fuel economy and she sounds a lot more aggressive all the way through. Therefore, I'm very pleased. If I wanted to tear the road up, I'll just jump into my 73 Chevy Caprice Classic 2door, small block 400 6.6 liter, and wake-up the block. That's your ride brother if you like it, I love it! See you in the wind!!! Just bought my first beamer.....hooked! Its a 05 325xi 5 sp manual with 27K mileage. I love the inside and the sound of the engine. I can't imagine how an M3 sounds or drives. Maybe someday. That said, how much does it cost to add the dinan upgrade. to a 3 series, approx? My advice is to go to the Dinan Web Site at www.dinancars.com - they have all the info you will need...you can get prices on individual upgrades or an entire S package. Their products are nice and well worth the money - in my opinion. Enjoy. I see that you are still within factory warranty. If you are looking to bump up your horsepower with mods, then DINAN is the way to go if not just for the quality of the products they manufacture but also because of the warranty they provide. Their website has literature on it. Check out Mike Miller's write up on his DINAN S-2 conversion in the February Roundel. 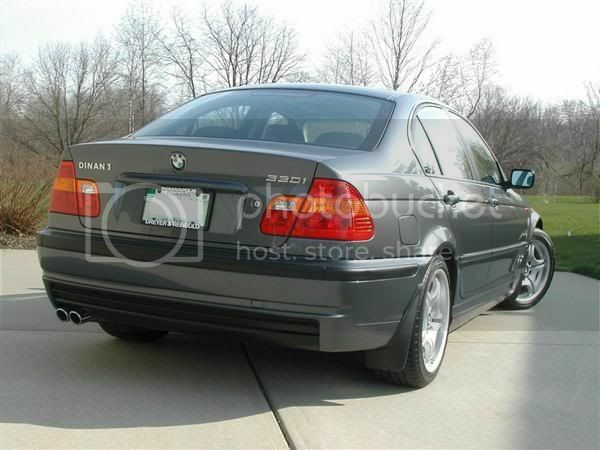 He's got the 2.5 liter M54 engine as well and is all about DINAN. I'm new to the CCA so forgive me if I'm missing something but this article isn't on line yet, is it? I got my first issue the other day and it looks like the issues on line only run through January. Can you summarize it for me? Thanks! I'm very curious because I recently bought a 2005 330ci with the ZHP, and I"m weighing whether I should get some aftermarket stuff through Dinan- likely starting with the air filter and then the software. .
Well, for four bucks the National office will happily send you the February issue. Or----this is the kind of guy I am!---if you remind me when I get home from Homecoming next week, I'll see if I can extract Mike's article from my electronic pile and send it to you as a PDF. . . . But that way you won't get all the other stuff in the February issue. . . like the COLUMNISTS! Thanks anyway, but as you can see from the date, I made this post awhile ago. I ended up going with the Dinan intake and computer upgrade, and I'm very happy I did. Applebimmer, tell me more. I have an '05 325ci and am considering the Dinan free flow system (in & out). I would like to hear your thoughts on the K&N system vs. the Dinan. What is the difference btwn Cold air intake and Free Flow intake? How many x-tra ponies does it actually translate to, is it discernable? I would consider the software but only if the power justified the $. Not trying to build a race car, just a small performance upgrade to my baby. Thanks for in advance for anyones info or hard earned/expensive knowledge. There is no difference between "free flow" and "cold air"- same concept. I would suggest checking both the Dinan website as well as K&N to find out what they claim in regards to horsepower gains. It looks like with your car, if you go with the Dinan intake, Flash the ECU, and get the muffler you probably get around 15 extra horses. K&N claims about 7hp with their intake alone. I have the Dinan intake, ECU flash and exhaust on my 2005 330Ci ZHP and I'm very happy with the performance. Dinan isn't the cheapest out there but it is very well made and not nearly as expensive as BMW's own aftermarket stuff. I definitely noticed a change in the cars performance with the upgrades. The Dinan CAI (carbon fiber or aluminum tubes) reached down into the brake duct. The Dinan free flow intake is an airbox that resides in the engine compartment. The CAI is no longer made.